Do you need a custom pickup? Do you want a custom pickup? Not satisfied with the pickup that came in your guitar? Looking for something different? We know the drill: Go to Guitar Center. Look at the pickups. Ask the dude behind the counter. Get confused. Go home and look through the websites of the big manufacturers. You scour the Les Paul Forum for the "Best replacement pickup" You sign-up for Harmony Central to get the lowdown from somebody you've never met or even talked to. You see the post -- "I'm looking for a tone like Slash with some Eric Johnson thrown in with more sparkle and fewer lows". The more you look the more frustrated you become. The trolls are ready to pounce when you ask a question. You thumb through Vintage Guitar magazine and you try to figure out why somebody needs another "really authentic" PAF clone. You see the guys you follow on Facebook talking about the true PAF tone. They post a video selfie tauting their authentic tone. You don't know if its good or bad, but if they paid $500 for a pair of PAF clones, they must be good. You are not sure where to turn. We were there about 15 years ago. The internet was in its infancy but there were newsgroups where guitarists would bare their tone souls and try to articulate what they were looking for. We tried to figure out what they were wanting and even we got frustrated. It was into this environment the first Williams Pickups pickups were born. The process is actually documented on this site, GuitarAttack.com. Through our site we got into the pickup building business kind of by accident. It has turned out to be very interesting and we've gotten a lot of tone satisfaction from the process -- plus a lot of one-off pickups for our own guitars. Unlike a lot of those web storefronts, we don't offer 50 different pickups for $30 each. We are not in a race to see how many pickups we can build. Our pickups are built one-at-a-time in our shop. They are not cranked-out in some sweat shop in a developing nation -- we are not exploiting kids to make our pickups! We do not have an import line with a goofy name like "EXP" or "GuitarAttack Designed." We make a lot of pickups, but our number one pickup is the AttackBucker. An AttackBucker is a custom wound, dual coil guitar pickup built in our shop. Developed over a period of years through a process littered with countless prototypes, the design is based on the great pickup designs of the 1950s and 1960s. The AttackBucker has two black coils, no cover, and a vintage-style 2-conductor lead. Click here to learn more about the AttackBucker. We also make variations of the AttackBucker. These include upgraded versions such as the AttackBucker+ (an AttackBucker with 4-conductor wiring which actually sounds good with a coil split) and the AttackBucker "BlackBack" (an upgraded AttackBucker we'll let you customize). We've recently been making a large number of a humbucking pickup we call the 1984 which, we believe, is a superior pickup for getting that high gain, harmonic-rich tone made famous in the mid-1980s. It is similar to the pickup designated with three letters that is currently making the rounds, but we think it sounds better and it is more affordable. And, we can relic the pickup for your custom build. Our newest pickup is the Super Duper, which is based on a mid-70s Japanese-made pickup. The original pickup was standard in what are normally called "Lawsuit Guitars". You can read the full story of its development on our site. Click here to see it. We have also built a large number of SingleWides, our take on a classic single coil. We make every Williams Pickup in our shop and it is an item that is special, difficult to make, and all about quality. No cheap magnets, bobbins, spacers, bases, or wire. If that is not what you are looking for, I invite you to check out eBay or buy a mass-produced pickup at Guitar Center or Musician's Friend. REMEMBER: Don't be embarrassed to shoot us an email and ask questions. We've found the number one reason guitarists wind up with something they don't want/need is because they don't ask questions. We know the deal -- it is tough to break in to the "cool guy circle" on the boards out there. There are lots of bandwagons, too...."I love this PAF clone and you are an idiot if you don't!" There are always those who always have a comment and are quick to jump on "noobs". We have a low-threat forum and you can always check that out. We get a lot of first-timer posters on the forum and that is pretty cool. Click here to see it. We are always chasing tone. We have never had a pickup returned because the buyer didn't like the tone. Let us know what you are looking for....let's start getting your tone. Click here to contact us. Click here for wiring diagrams. For the Forum Rats out there, here are some reviews. These are the real deal -- we didn't make these up! Thanks for the follow up. It is perfect!!!! John, Just got the red Frankenstein done, and I wanted to tell you how impressed I am with the 1984 pickup! I have 2 other versions of VH franks, one with a Seymour custom custom, the other with a '59 Seymour and neither has the growl and snarl of the 1984. I plugged in the Seymour's, left the amp settings and switched to your pup and it went from an AC/DC type tone to a VH1 "Feel Your Love Tonight" tone; No Comparison! Thanks for such a great pickup! Just thought I'd send a note. Installed the pick up and it sounds fantastic! Love it. I have the "Black Back" AttackBucker installed in a Basswood body that I custom made to fit my playing style, and have not painted the guitar yet. I love the sound, in fact I think I will never paint it. Funny, but I like this guitar the best. I would like to order another, exactly the same. I always like to have a guitar in the works. I sent your sound clips to a few of my friends, they love your pickups and love the sound. It took a while before I got my guitar mod done, my tech is a professional luthier and earns his living when repairing and building guitars. I let him modify the neck on this strat, too, so I decided to wait and let him do the wiring job at the same go. I know nothing about technical things but I tell you this. 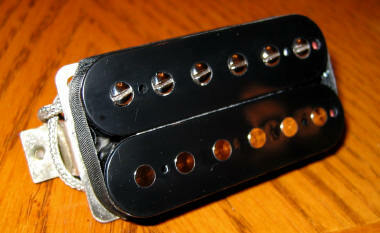 Your pickup is the best PAF style humbucker for early EVH tone on the market, full stop. I�m 46 years old, and I�ve been looking for this sound since I heard �Ain�t talkin� �bout love� in the radio a long time ago. I even took out the bridge pickup of my �68 SG to try it in my strat (long time ago) but for some reason it did not do it for me. This pickup has brightness but it is warm at the same time, and it maintains exceptional clarity even with cranked amp, which of course is essential for EVH style with artificial harmonics, but it also has serious punch when playing those EVH trademark licks. Excellent! The guitar looks a little plain at its� case, but strapped on it is just perfect��no tape here, I�m too old for that! Hello. I bought one of your attackbuckers last year and sold it. Now I miss it! So I am buying one from a guy but he won't send me a pict of the back of the pickup. I want to make sure it's one of yours. What does the back look like? I don't remember. And how do I know it's an attackbucker and not a one off custom? (Note: We keep track of the serial numbers and purchasers. We can help you identify a second-hand Williams pickup).